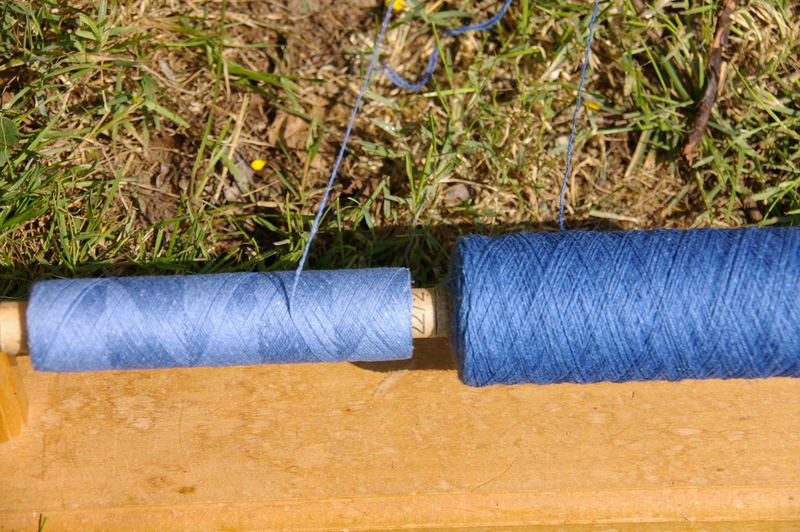 These two blue yarns, linen on the left and cotton on the right were wound on together for the warp. It really helps to have them on a lazy kate so that they run smoothly when you start to thread up. Using a 10 dent (40/10cm ) reed with this fine yarn threaded double gives a good drape to the fabric. I like to thread up across the reed with my main colours leaving gaps as I go. Then I fill in with other yarns in shades of blue using up small amounts. 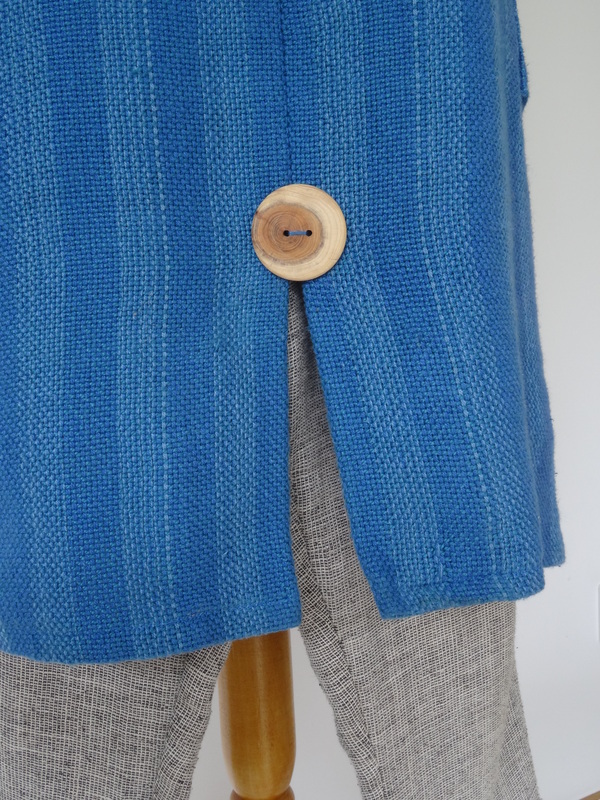 This can give your fabric an interesting depth of colour without making too obvious a stripe and will ensure that both selvedges use the same yarn so that the weaving will tension evenly. 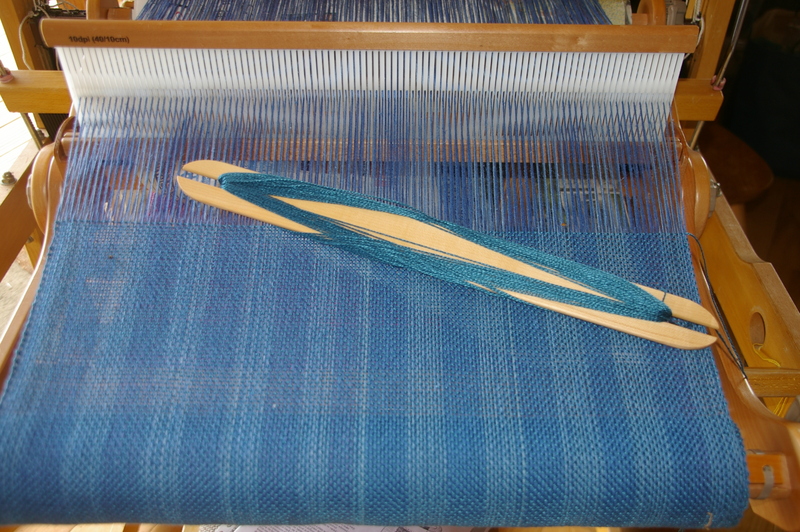 The weft is a lovely smooth mercerised cotton in a DK thickness and a slightly warmer blue which offsets the mixed warp. It grew really quickly and was nice to work with on the 20″ (50cm) Ashford Knitters loom which is really one of my favourites as it is so easy to use and travels well. I washed the fabric in hot soapy water before hanging it on the line to dry on a nice breezy day. It shrank by about 4″ (10cm) in length and 1″(3cm) in the width. 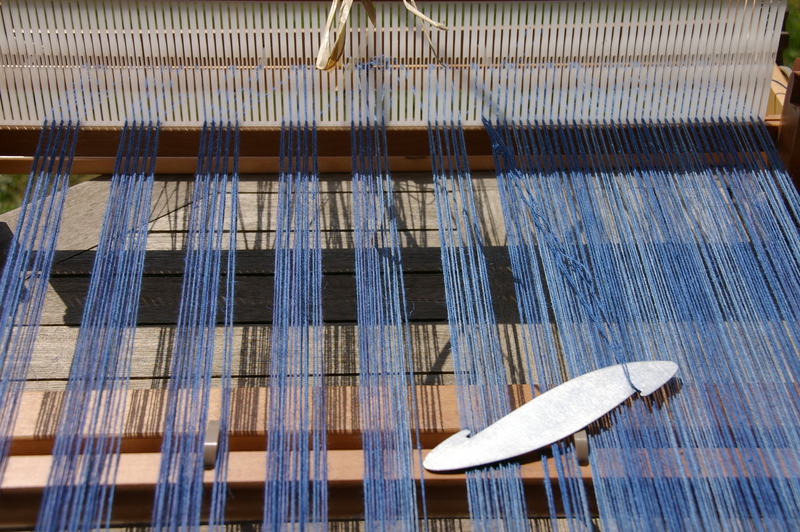 Its always important to wash your weaving before you cut it out so you know what you length you have to work with and there are no hidden surprises! 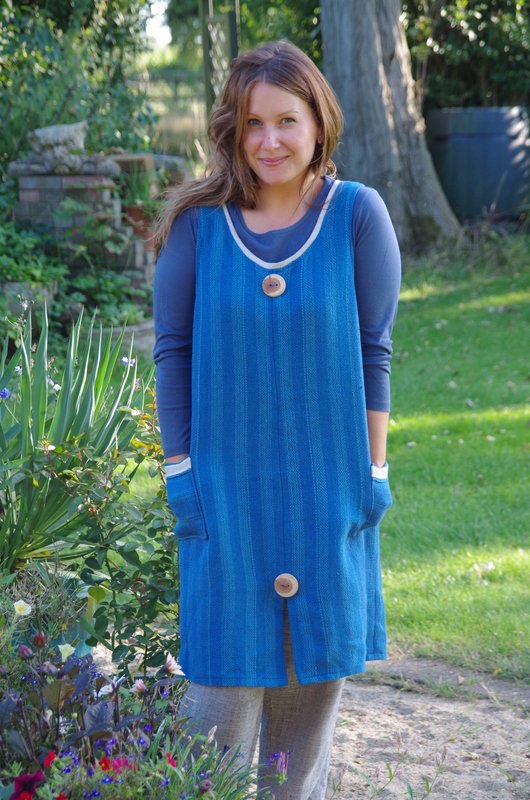 As the fabric is 18″ (46cm) wide I have a centre seam down the front and back of the dress. I left a good gap at the bottom to give lots of movement and secured the seam with a feature button. No pinafore dress would be complete for me without pockets of some sort or another. These are evenly positioned across the side seam so that the dress hangs well and is not pulled down in the front by their weight. 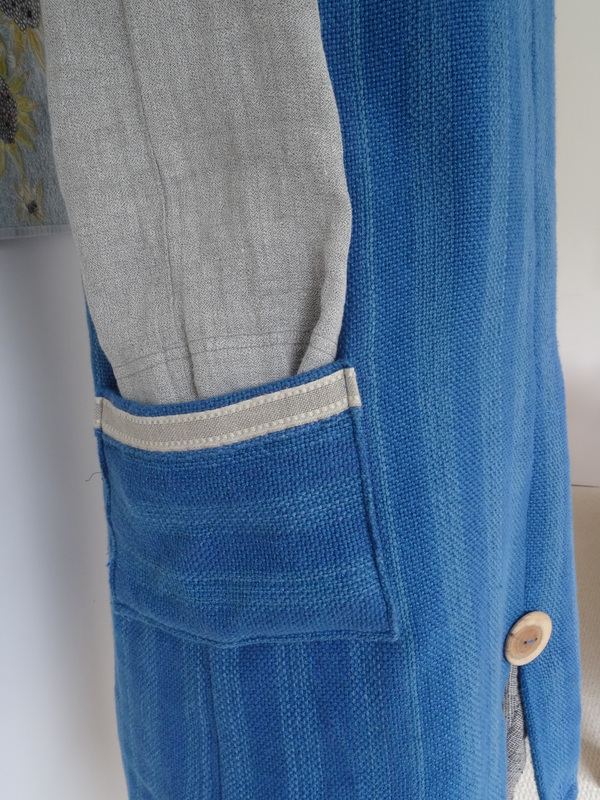 The linen ribbon across the top of the pockets is also made by the namolio people. Use the woven iron-on interfacing over the back of the pocket before you sew them on to give the fabric extra strength, and don’t forget to use it on all your seams after cutting out. 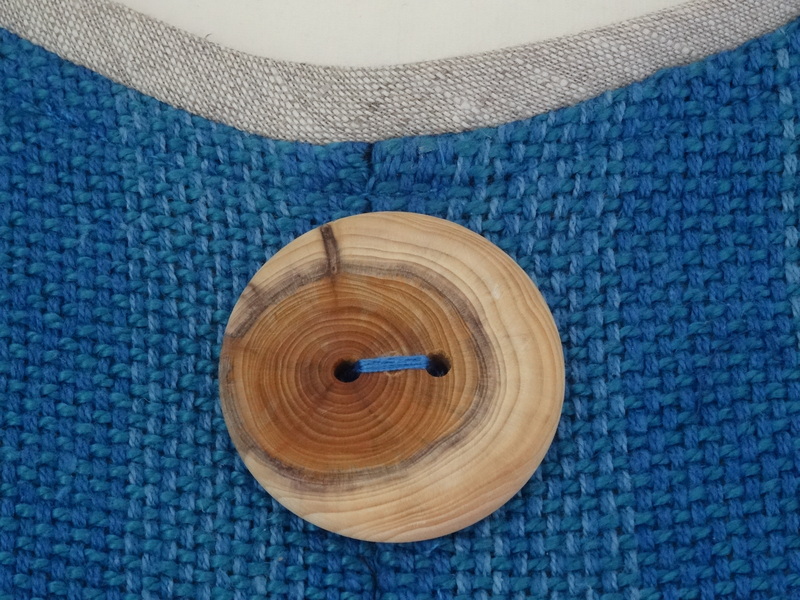 It makes sewing your garment together so easy with no worries about fraying edges.